Anuarite was in need of help. She was cooperative in following directions but refused to speak to the staff. She blankly stared ahead. Her mother accompanied her on the long walk to the clinic. She reported that Anuarite had stopped speaking completely when her husband left her and sold their land. Soon after, two of her six children had passed away and also her father. He was killed in the war. 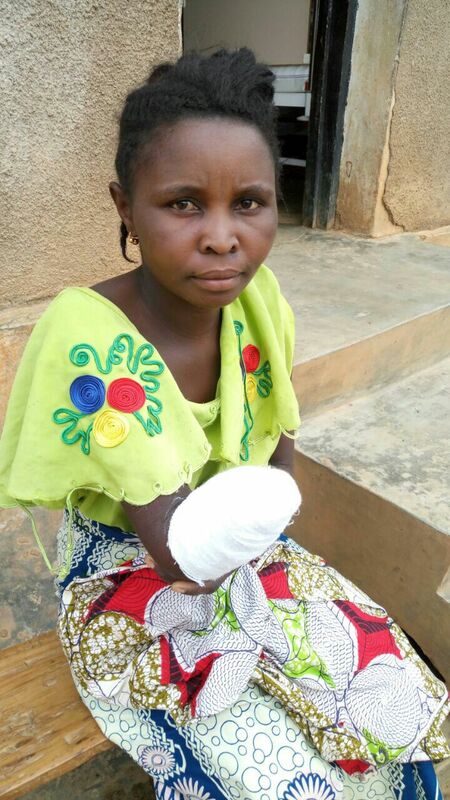 We believe two of her children are currently living with family in Goma and the other two with family in a heavy fighting area south of Lubero. The staff tried multiple times to interview her and her mother, but they did not share a lot. There is always more to the story. Her right hand was necrotic. It needed to be removed. Her thumb and two digits were black and cold - gangrenous. The other two digits were close behind. The entire hand was swollen with large cracks in the skin that were draining pus. The infection also appeared to be marching proximal despite IV antibiotics. How it all occurred seemed unclear but supposedly she had received an injection at another medical clinic into that hand. We think it became necrotic possibly 8 weeks prior to meeting her. The whole disease process must have been extremely painful for her. It could have easily spread systemically if the amputation was not performed soon. Explaining this and counseling her and her mother regarding the amputation was tough. Without verbalizing her thoughts and wishes it was a difficult call to make. The Lubero hospital, where GRI is currently working from in DR Congo, had a psychologist see her both for her current issues and to prepare her and her mother for the amputation. The amputation went well and she is recovering well. It can't be easy to be a woman with an amputated hand in her area of the world. The daily chores are so physically strenuous. Her mother said she will take care of her. We hope that with continued help Anuarite can begin to heal both physically and emotionally.